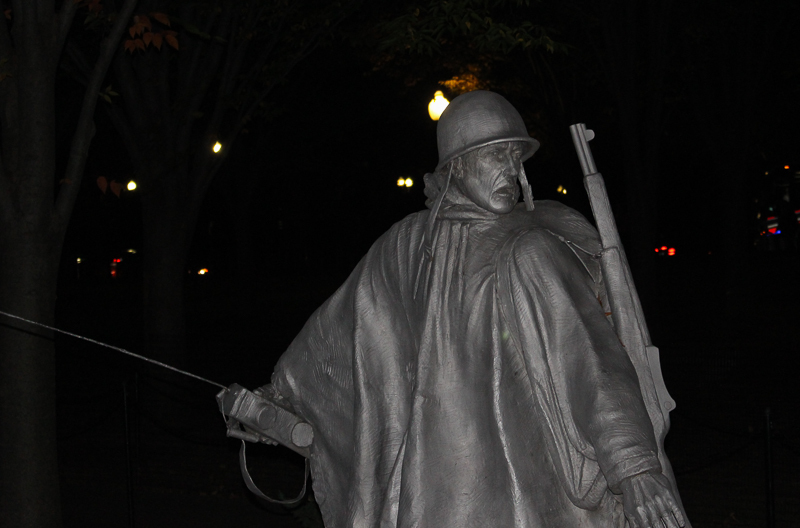 The Korean War Veterans Memorial in Washington DC is situated SE of the Lincoln Memorial between Independence Avenue and the Reflecting Pool is one of DC’s fabulous night views. I feel fortunate to have seen it for the first time when it was dark out – under a nearly full moon. I’ve taken visitors to see the sites in Washington DC all of my life, which is why it’s surprising that my friend Maria who was visiting from the UK, told me about the Korean Memorial when I was showing her the Lincoln Memorial. I’d never heard of it. I spent the day in DC with Maria and told her that after dinner we should visit the Lincoln Memorial at night because the white marble sculpture of Lincoln standing 30 feet above the floor in its columned portico are spectacular set against the blackness of the night sky. We saw it, and it did not disappoint. 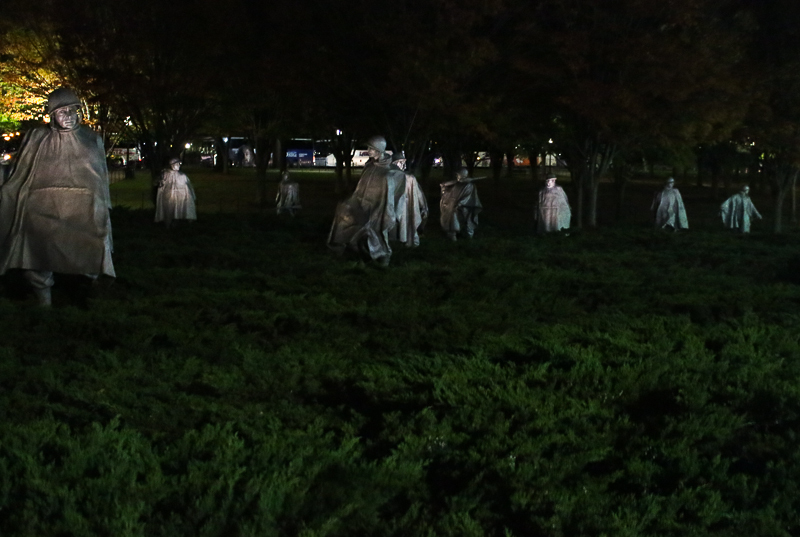 But afterward, Maria said that she’d heard the Korean memorial was especially gripping at night. 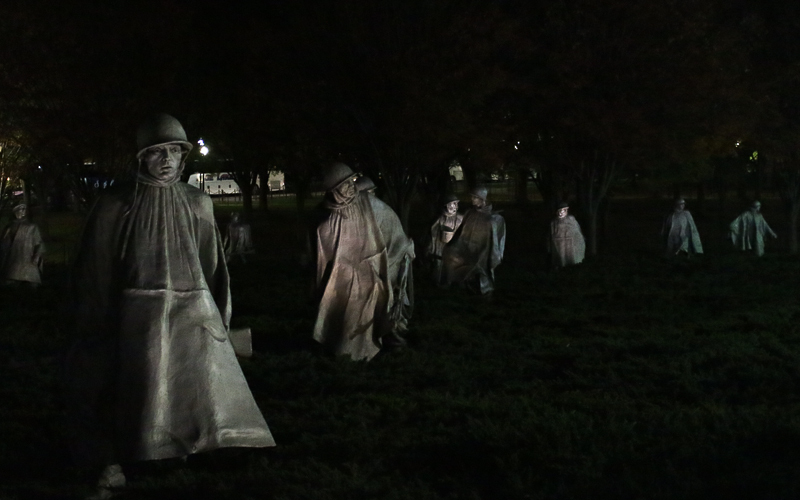 We found the memorial, but it was more eerie than beautiful. 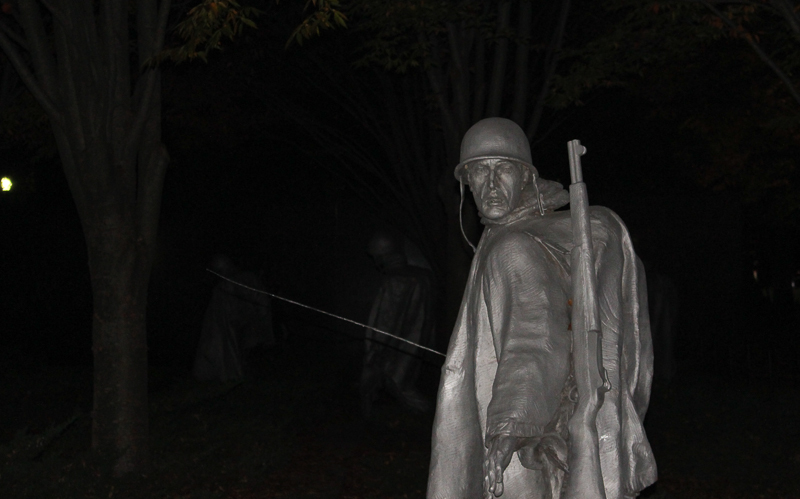 The nineteen stainless steel statues of American soldiers walking if full combat garb across a juniper ground-cover separated by strips of shiny black granite look hauntingly alive. The soldiers appear to be in motion. If you look at them with your peripheral vision, they seem to move. The juniper and granite are supposed to represent the rugged terrain of Korea – rocks and bushes, but at night the granite glimmers like water and makes the setting appear more like a wetland or rice field. The steel figures recreate a squad on patrol. Each branch of the US armed forces is represented. There are fourteen Army soldiers, three Marines, one Navy Corpsman and one Air Force Forward Air Observer. The faces of the statues have expressions of fear, concentration, and deliberation. I tried to sense what emotion this memorial stirred in me. It was fear – the fear of thinking what these guys were up against. Perhaps in the daylight, the emotion would have been different. Not so visible at night are the 2500+ photographic images etched on a polished granite wall that borders the memorial. The images are taken from actual photographs of the land, sea and air troops who supported the war effort. They were sandblasted into the wall. 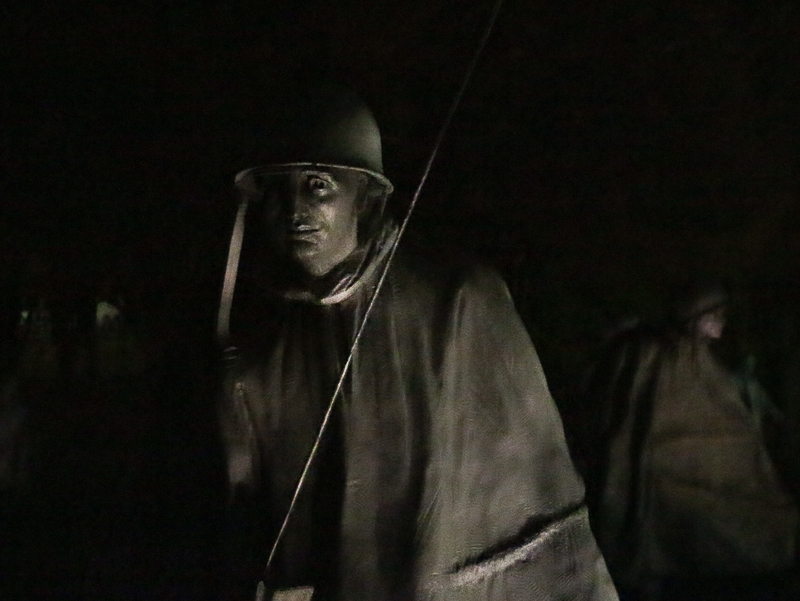 In the daylight, the nineteen statues are reflected in that granite wall making it appear like there are 38 soldiers. This represents the 38th parallel that formed the border between North and South Korea before the war. Adjacent to the triangular patch of soldiers bordered by the granite wall is a reflecting pool call the Pool of Remembrance. It’s surrounded by a grove of wild linden trees. There are inscriptions of those killed, wounded, missing in action and held as prisoners of war. On the south side of the memorial are three Rose of Sharon bushes – the national flower of South Korea. At night these elements of the memorial are not so prominent. They are overshadowed by the silver men who seem to move under the moonlight. Also near this memorial is the Vietnam Memorial which is certainly worth a visit, but not much to see at night. But a night walk along the Reflecting Pool (if the weather isn’t bad) provides about as much inspiration as any walk could. The views of the two monuments on either side of the Pool gets every person thinking. 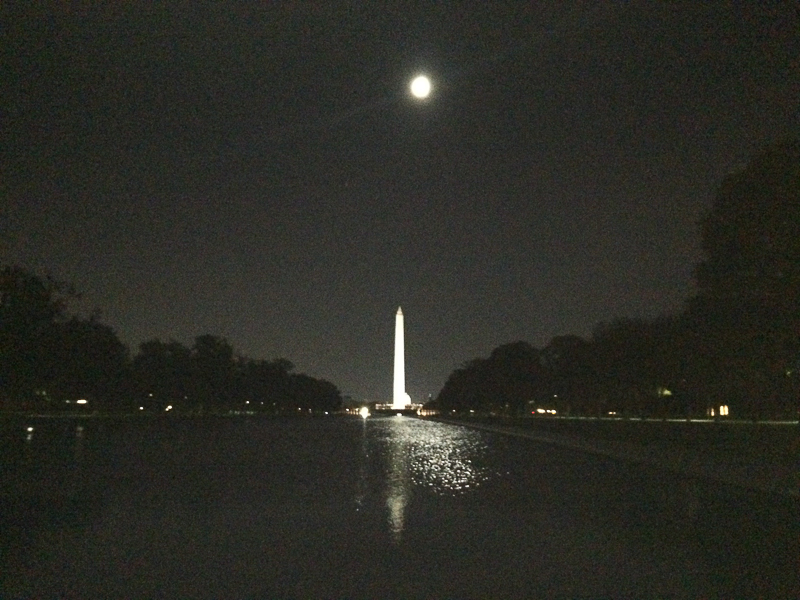 The Washington Monument under a full moon at the Reflecting Pool.